"Johannes Climacus" redirects here. For the philosopher who used this pseudonym, see Søren Kierkegaard. There is almost no information about Jon's life. 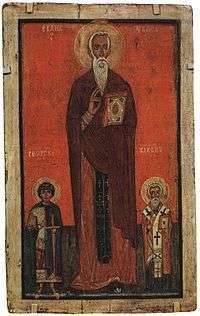 There is in existence an ancient Vita (life) of the saint by a monk named Daniel of Raithu monastery. Daniel, though claiming to be a contemporary, admits to no knowledge of John's origins—any speculation on John's birth is the result of much later speculation, and is confined to references in the Menologion. The Vita is generally unhelpful for establishing dates of any kind. Formerly scholarship, on the basis of John's entry in the Menologion, had placed him in the latter 6th Century. That view was challenged by J.C. Guy and others, and consensus (such as there is) has shifted to a 7th Century provenance. If Daniel's Vita is trustworthy (and there is nothing against which to judge its accuracy), then John came to the Vatos Monastery at Mount Sinai, now Saint Catherine's Monastery, and became a novice when he was about 16 years old. He was taught about the spiritual life by the elder monk Martyrius. After the death of Martyrius, John, wishing to practice greater asceticism, withdrew to a hermitage at the foot of the mountain. In this isolation he lived for some twenty years, constantly studying the lives of the saints and thus becoming one of the most learned Church Fathers. When he was about seventy-five years of age, the monks of Sinai persuaded him to become their Igumen. He acquitted himself of his functions as abbot with the greatest wisdom, and his reputation spread so far that, according to the Vita, Pope Gregory the Great wrote to recommend himself to his prayers, and sent him a sum of money for the hospital of Sinai, in which the pilgrims were wont to lodge. Of John's literary output we know only the Κλῖμαξ (Latin: Scala Paradisi) or Ladder of Divine Ascent, composed in the early seventh century at the request of John, Abbot of Raithu, a monastery situated on the shores of the Red Sea, and a shorter work To the Pastor (Latin: Liber ad Pastorem), most likely a sort of appendix to the Ladder. It is in the Ladder' that we hear of the ascetic practice of carrying a small notebook to record the thoughts of the monk during contemplation. The Ladder describes how to raise one's soul and body to God through the acquisition of ascetic virtues. Climacus uses the analogy of Jacob's Ladder as the framework for his spiritual teaching. Each chapter is referred to as a "step", and deals with a separate spiritual subject. There are thirty Steps of the ladder, which correspond to the age of Jesus at his baptism and the beginning of his earthly ministry. Within the general framework of a 'ladder', Climacus' book falls into three sections. The first seven Steps concern general virtues necessary for the ascetic life, while the next nineteen (Steps 8–26) give instruction on overcoming vices and building their corresponding virtues. The final four Steps concern the higher virtues toward which the ascetic life aims. The final rung of the ladder—beyond prayer (προσευχή), stillness (ἡσυχία), and even dispassion (ἀπαθεία)—is love (ἀγάπη). Originally written simply for the monks of a neighboring monastery, the Ladder swiftly became one of the most widely read and much-beloved books of Byzantine spirituality. This book is one of the most widely read among Orthodox Christians, especially during the season of Great Lent which immediately precedes Pascha (Easter). It is often read in the trapeza (refectory) in Orthodox monasteries, and in some places it is read in church as part of the Daily Office on Lenten weekdays, being prescribed in the Triodion. St. John's feast day is March 30 in both the East and West. The Eastern Orthodox Church and the Byzantine Catholic Churches additionally commemorate him on the Fourth Sunday of Great Lent. Many churches are dedicated to him in Russia, including a church and belltower in the Moscow Kremlin. John Climacus was also known as "Scholasticus," but he is not to be confused with St. John Scholasticus, Patriarch of Constantinople. Several translations into English have been made, including one by Holy Transfiguration Monastery (Boston, 1978). This volume contains the Life of St. John by Daniel, The Ladder of Divine Ascent, and To the Pastor, and provides footnotes explaining many of the concepts and terminology used from an Orthodox perspective, as well as a General Index. Søren Kierkegaard, who published several works under the pseudonym "Johannes Climacus" and two under the pseudonym "Anti-Climacus"